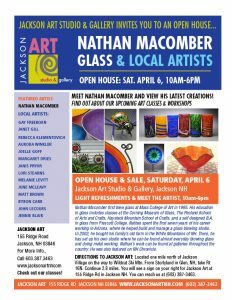 Jackson Art Gallery features an eclectic mix of contemporary, cutting age work from local artists and artisans. This is not your typical gallery. Many of the paintings include a different take on our local landscape with thought provoking color and innovative compositions. 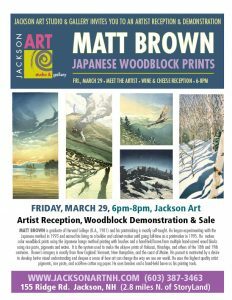 The gallery also includes watercolor monotype, mixed media collage, photography, sculpture, jewelry, glass, cards, scarves, handbags, prints and home furnishings. This is an affordable gallery with some original work under $100. We are opened every Saturday from 10am-5pm and during the week by appointment or by chance. Call (603) 387-3463 for an appointment. Just off of Rt 16N on your way to Wildcat Ski Mountain and Great Glen Trails – 155 Ridge Rd, Jackson, NH.